We assembled a team of six media members across the state to each select one player (or unit) each week. We will track the cumulative statistics of our selections throughout the season similar to fantasy scoring. Check back next weed to see our final standings for the 2015 season. See the bottom of this article for details. The junior quarterback has completed 135 of 226 passes for 1,998 yards and 20 touchdowns. He's passed for more than 200 yards in five games and boasts a season high of 393 yards and seven touchdowns during a 53-12 win over Parsons on Sept. 25. Expect the Grizzlies to throw the ball early and often as they go for their first district win this week against the Chanute Blue Comets. Joe Dortland, with his calm and collected demeanor, has played outstanding for the Knights since taking over in Week 2 when Brady Dinkel went out with health issues. Dortland has helped Victoria maintain the No. 1 ranking in Eight-Man, Division II and carry a 19-game winning streak into Thursday's district-deciding contest at undefeated Otis-Bison. Dortland has accounted for 19 scores. Edmisten was a Kpreps Class 6A all-state selection in 2014 after rushing for 1,523 yards and 32 touchdowns. He helped the Lancers capture the schools’ first-ever state championship with a win over Hutchinson. This season the Lancers are 7-1 and have a district championship game with rival Shawnee Mission North this week. Edmisten has rushed for 873 yards and 16 scores this season. Elston has led Eudora to five consecutive wins after beginning the season 0-3. The senior quarterback has rushed for 1,402 yards and 19 touchdowns on the season. Elston has also added three touchdown passes for the Cardinals. On defense, Elston has recorded 86 tackles, seven interceptions, and forced four fumbles. Eudora travels to Baldwin this week having already clinched the District 3 championship. After struggling with an injury for much of the early part of this season, record-breaking running back Zack Melius has returned to near full strength the last three weeks. Melius has pushed his yardage total over 1,000 yards on the year. If Melius, a senior, remains at full health he'll likely propel the Bombers over a struggling Stockton team, and help Wakefield post at least six wins for the second season in a row. Putz (5-11, 170) has had an exceptional sophomore season for the Stags. Puts, who has verbally committed to play baseball at Notre Dame, has completed 67 percent of his passes for 2,274 yards and 24 touchdowns with only three interceptions. His season low was a 206-yard performance against Spring Hill in which he threw a season-high five touchdown passes. Putz has also added three rushing touchdowns this season. 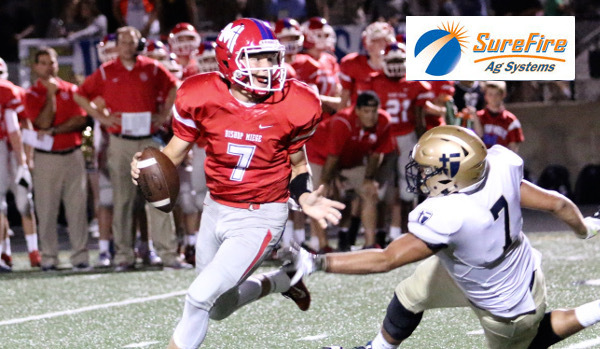 Miege will be heavy favorites at home against KC Sumner Academy.